The A9 has reopened after a serious collision involving a lorry and a car between Balhaldie and Dunblane. The incident happened at about 12:55 approximately one mile from the Shell Service Station heading towards Stirling. 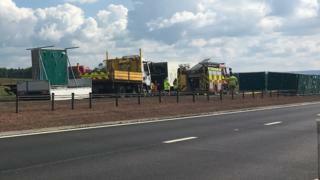 The southbound carriageway was shut for several hours as police, fire crews and the Scottish Air Ambulance attended. There was no information about the condition of the casualties.